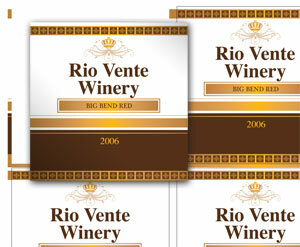 We offer wine labels any size or shape or choose from our label templates. We have laser or inkjet wine labels in many materials. Up to 250 sheets of labels processed within 24 hours after receipt of order. No die charge on Short Run Jobs. For a Roll Label Quote, please Contact Us. We offer blank or custom printed Inkjet or Laser Printable Wine Bottle Hangers any size or shape. Laser or inkjet Wine Bottle Hangers in over 100 materials. Print your own Wine Bottle Hangers with a laser or inkjet printer. 10 to 250 sheets of labels processed within 24 hours after receipt of order. No die charge on Short Run Jobs. We stock materials for any size Wine Glass Name Tags you may need for your use. 10 to 250 sheets of Wine Glass Name Tags are processed within 24 hours after receipt of order. Rippedsheets.com can provide you with any sized from our stock materials (no die charge on less tHan 500 sheets). Call us at 888-791-9590 for sizes. Wine Glass Name Tags are precision kiss cut through the printable facestock of the label material down to but not through the label sheet liner, so that the Wine Glass Name Tags can be removed easily from the label sheet after printing. Send us your design and we can custom print for you.